Para wasn’t sure if she should be impressed by the dimensional shutdown device. As Sue pulled the sheet off, Para took in the lights at the top, the vertical lines within a rectangle within an oval, and the buttons on the pad below, and decided… it didn’t look that complicated. What was there to be impressed about? “Maybe someone’s been playing all of us,” Thred suggested. He glanced at Alice. Para got the distinct impression that Marlin was hoping to use ‘dealing with that’ as a chance to escape Usa, but he did have a point. She moved closer to Chartreuse. “I don’t suppose you’re able to get any useful impressions?” Para murmured. In response, Chartreuse nibbled her lower lip. “Except what if, once we throw the switch, it never turns off again,” Sue cautioned. She took off the jade ring she’d been wearing to help acclimate her powers gradually to their surroundings, and reached out to give it to Para. Para took it, then watched as her mission commander moved to one of the unconscious scientists on the floor. Chartreuse passed a crystal around his head, and finally reached out to touch his forehead. “Chartreuse is learning about the device,” Para said, holding up her hand to prevent Usa’s advance. She was pretty sure it wasn’t through whatever means Alice had implied, but still. “I kind of thought that guy running off for reinforcements was an issue,” Marlin groused. But other than shaking free of Thred, he made no further objection. The device was large enough that both Thred and Sam were needed to carry it. Sue was the one who grabbed a couple of the portable dimensional devices from the back, Usa not wanting to let Marlin, Alice, Chartreuse or Para near them. Para could understand that. They all headed back out to the entrance room, which by now had plush kittens littering floor everywhere. Para helped to clear a space on the ground underneath the rift, so that the device could be set down. Everyone stood back, leaving Sam standing next to it. “Okay,” Sam said, taking a breath. “So we turn it on.” Sam hit the TARTS/POTS button. There was a pause. Another plush kitten fell to the floor. “…and nothing happens.” He crouched down for a closer look. “Dial? I thought when this thing was on, it would turn everything else off,” Thred grumbled. “Then why have the buttons for CANS and NO ANTIDOTE?” Marlin sniped back. As she spoke, another plush kitten fell out of the rift. It bounced off Sam’s head, and knocked against the CANS button. More of the machine lit up, and pulses started to scroll across the rectangular box with the vertical lines. “Oooh, he’s at the twenty, the ten, touchdown,” Alice murmured. “Fine, it’s a scan. What’s it scanning for?” Thred wondered. “Dammit,” Usa muttered. She ran over to the main desk, and the console there. “Fortunately I have the codes to turn that off. Oh, hello Polsit,” she remarked, seeing the unconscious man there. She quickly typed in her codes. Chartreuse looked over at Sue. “How much time do you think we have before Shay storms in here with more troops?” she wondered. Para cleared her throat. “Ah, hello? It occurs to me that Alice probably has some experience.” After all, Alice’s time spent manning the Epsilon Station, coupled with her eidetic memory, had to count for something. “That’s not a good idea,” Thred protested. Usa pulled a gun out of the main desk. “This only stuns,” she remarked. “But as Sam said, don’t try anything funny.” She trained it on Alice as Sam and Thred managed to unscrew the back, revealing all the electronics. “Oooh, pretty,” Alice muttered. She both peered and felt around inside for a bit. Para spent the time looking at the reactions of everyone there. Only Usa didn’t seem tense, probably due to her security training. As they waiting, more plushies rained down from the rift near the ceiling. “As interesting as that is, can you point to the bits that would be proof for Usa?” Sam wondered. Para spun to see where Alice was looking. In the entranceway stood Shay, and some woman who seemed to be part cat. They were pointing guns of the same type that Usa was holding. One was aimed at Sam, who was closest to the device, the other was aimed at… her. 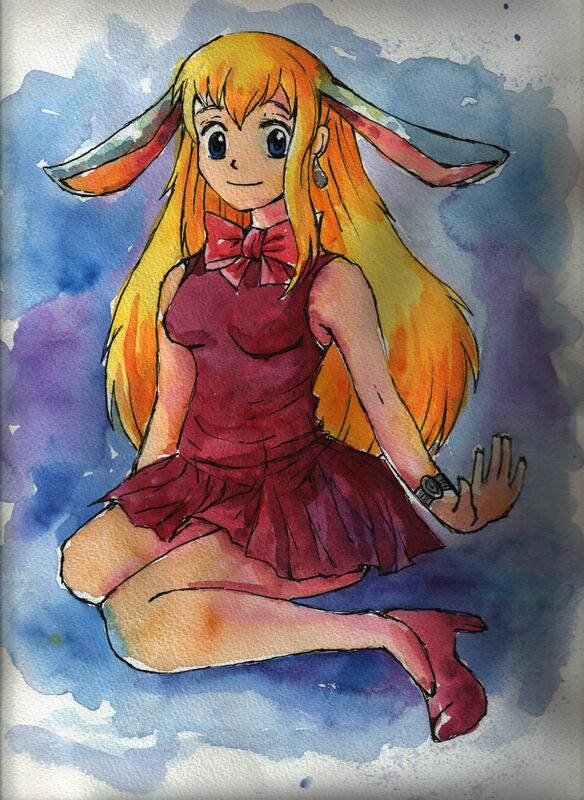 Para felt her bunny ears quiver. Even as Para processed that her being a target was likely only because she was the one standing closest to the two arrivals, she was tackled to the floor. Somewhere, someone called out, “Sam!”. With that, there was the sound of three guns going off. Para rolled to the side to take in the scene. Apparently Thred had jumped in front of Sam, and he now lay sprawled out on the ground. Shay, over by the entrance, was also unconscious, with the cat woman and Usa now pointing their guns at each other in a stand-off. And the one who had tackled Para… had been Chartreuse. She was also unconscious. Para honestly wasn’t quite sure how to feel about that. Wasn’t it the role of subordinates to protect their leaders, not the other way around? Yet Chartreuse had taken the hit for her. As such, Para resolved to make sure Chartreuse was kept safe. She reached out to brush her fingers against Chartreuse’s hair, only to pause as someone spoke. The cat woman seemed to think about it. “I think not,” she said at last. Then she adjusted her aim, and shot at the dimensional shutdown device. Sparks flew from the ‘on/off’ switch. The stun field had to be electronic in nature. What had Mary-Lynn done? Well, that couldn’t be good. Para scanned over everyone present for their reactions one more time. She couldn’t be sure, but three people seemed like they were about to try something. Marlin, surprisingly enough, had his hand twitching towards his wand. A final escape attempt? Or was there something magical he could do to repair the device? More interestingly, if a dimensional traveller were the key person behind foiling the plan, what would that say to someone like Shay? Sam also seemed tense, as if he was about to make a jump… somewhere. To grab Usa’s gun? For Alice’s invulnerability item? Para wasn’t sure what he hoped to accomplish, but a success might cement his involvement with the group of dimensional investigators. Just as a failure could ruin his chances forever. Then there was Sue, who seemed a bit translucent – as she had her invisibility power on her side. Could she use that to convince Mary-Lynn to fix things? On the plus side, it would mean that someone who had been involved with Council affairs would be cleaning up their own mess. But then, maybe that would simply perpetuate a system that needed to change. As Para finally completed her movement to softly touch Chartreuse on the head, she wondered what was going to happen. The improvisation decision included that part of where Chartreuse was trying to get an impression that would be of use. Had Usa known how the device worked, they would have been able to negate the charge as Alice implied, making for a different cliffhanger at the end (more of a hostage situation?). And if Usa could have found Shay, it would have meant a return to the hidden Council room, now with some important documents. There was also another aspect decided with that vote, which we won’t see until the last part. And I had no real plans on the device, so thanks to John Golden for the Mattel suggestion. A few things! First of all, yes, I’ve been playing with anagrams this whole story as far as names are concerned, Alice kind of lampshading the title itself. (See also, this entry title.) Only two names haven’t involved anagrams, did you catch them? Secondly, when this “Epsilon” ends, I will likely return to the follow-up Melissa Virga story from my archives, unless anyone has another preference (recall the options were in this post). Comments are open. Finally, a Happy New Year to you – here’s the results of the 2018 coins I received over the past 363 days. 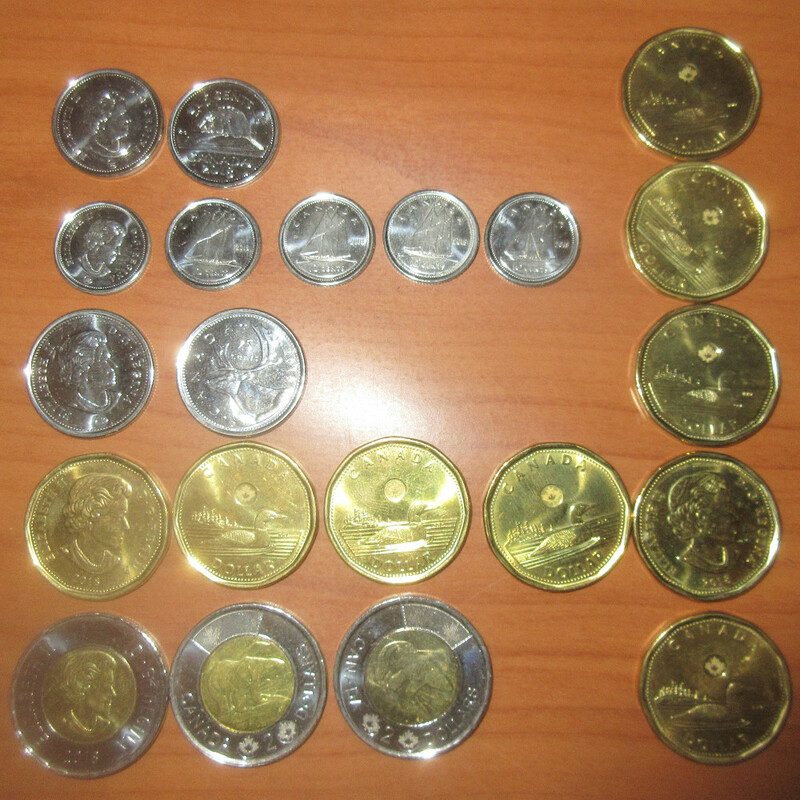 Namely 3 toonies, 9 loonies, 5 dimes, and 2 each of quarters and nickels, for a total of 21 – no differing designs. You may recall 2017 had 20 coins while 2016 had 37 coins and 2015 had 42 coins. I have no theories, merely the data. Wondering why this is a thing? Consider reading my Time & Tied story. That’s everything, hope you stay tuned for the conclusion of “Chanced Erasures”.